CIGAR.com does not sell products to anyone under the age of 21. CIGAR.com does not ship products to South Dakota. Shipments are processed Monday through Friday, excluding holidays. Business days for shipping carriers are Monday through Friday, excluding holidays observed by that carrier. CIGAR.com does not collect sales or use tax on purchases made from Louisiana. Louisiana requires CIGAR.com and other retailers to notify purchasers that sales via the internet, catalog, or other remote means are subject to use tax. CIGAR.com does not ship products to South Dakota or Utah. Due to FAA regulations, expedited services are not available. These items will ship via USPS Parcel Post and may incur additional delivery time, up to 3 weeks in some cases. These items will ship via ground/freight services and may incur additional delivery time. Some items may also incur additional shipping charges which will be disclosed on the product info page. Delivery may not be available to PO Boxes, APO/FPO, and US Territories for certain items. UPS Next Day Early AM and Saturday Delivery options are available. Contact customer service to arrange for a special shipment request or call Toll Free: 800.357.9800. 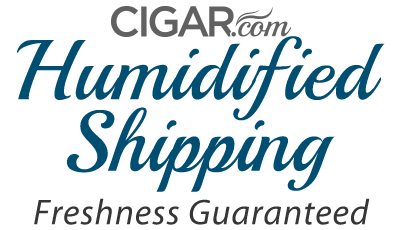 When storing, shipping, and transporting your cigars, humidification is a concern. CIGAR.com relies on Water Pillows to guarantee our cigars remain fresh in transit. Water Pillows are extremely absorbent and come packaged in a permeable material that releases moisture to maintain an ideal environment for your cigars. Simply dipping it in distilled water activates the pillow for up to 30 days. Best of all, each Water Pillow has a long life span so they can be reused. Fresh cigars delivered to your door is what we're all about at CIGAR.com. As part of our commitment to providing our clients with the best possible service, all orders for single cigars and most sampler packs are shipped with Water Pillow technology, free of charge. Additionally, if you're giving cigars as gifts, they will remain fresh until the special occasion. CIGAR.com is the only dealer providing this service. That's the CIGAR.com difference!